Due to competitive concerns, there is a Buyer a pre-approval process. Contact your sales representative to find out more. EquipNet recognizes that these requirements may be different to previous transactions with EquipNet. We are here to help with any questions you may have as you complete this purchase. Please feel free to contact your EquipNet Sales Representative or the Teva Project Manager, Mike Hudson. Mike's number is +44 7751 985547 and email is mhudson@equipnet.com. 1. TEVA Pharmaceutical Works Private Limited Company (Registered office: 13. Pallagi str, Debrecen, 4042, Hungary) (?Seller? ), is the owner of good(s) and valid title to , and Seller desires to sell the Equipment to, ________________________________________ (?Buyer?) a corporation, and Buyer desires to purchase the Equipment from Seller, on such terms and conditions as have been mutually agreed upon by Seller and Buyer. For good and valuable consideration, the receipt and sufficiency of which are hereby acknowledged, on this day of at 82 T?ncsics M. str., G?d?llő HU-2100, Hungary (Branch office of Seller), Seller does hereby sell, convey, transfer, assign and deliver to Buyer and assigns all of Seller's right, title and interest in and to the Equipment, to have and to hold unto Buyer and assigns, to its and their own use and benefit forever. (d)	that it is acting at arm?s length from Seller, and Buyer has completed to its satisfaction all investigations, inspections and tests that it deems necessary, in its sole discretion, to determine, among other things: (i) the condition of the Equipment, including (A) any cephalosporin contamination and (B) the existence of patent or latent defects in the construction of the Equipment, (ii) the status of all governmental requirements of whatever kind regarding the Equipment or any past, present of future uses of the Equipment, including the status of any permit, application, license, approval, certificate or other intangible right of whatever kind regarding the Equipment or any intended use of the Equipment and (iii) the status and effect of all recorded covenants and restrictions related to the Equipment or any intended use of the Equipment, it being agreed as set forth above that Seller makes no representations and gives no warranties regarding any of the matters set forth herein or otherwise. (e)	Some equipment may be contaminated with Cytotoxic drugs. 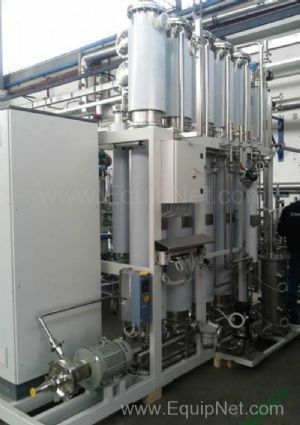 This equipment is clearly indicated in the description and they will not be used by the buyer in any other different activity from Cytotoxic drugs manufacturing. Cytotoxic drugs: drugs that possess the ability to interact directly with DNA or DNA associated macromolecules, resulting in growth arrest and cell death. In addition, a cytotoxic agent causes such a damage in an indiscriminate manner, affecting healthy cells in addition to abnormal (e.g., tumour) cells and causing serious systemic toxicity. 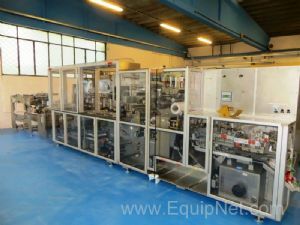 (f)	Some equipment may be contaminated with Potent Drugs and all of the equipment was cleaned to a validated standard. This equipment is clearly indicated in the description and they will not be used by the buyer for any other different activity from pharmaceutical drugs manufacturing. For the purposes of this agreement, a potent compound is a compound (API) with assigned OHC of 4, 5, and 6. (g)	Some equipment may be contaminated with Active Pharmaceutical Ingredient (API) and all of the equipment was cleaned to a validated standard. This equipment is clearly indicated in the description and they will not be used by the buyer for any other different activity from pharmaceutical drugs manufacturing. Active Pharmaceutical ingredient (API) ? Any chemical or biochemical substance having pharmacological activity that may be used in the treatment or prevention of an illness or injury. (h)	Some equipment may not be contaminated with any Hazardous Materials. This equipment is clearly indicated in the description. 2.1. Considering that the Buyer is aware of the contaminated condition of the equipment, the liability of the Seller shall be excluded for any claim or damage stemming therefrom. For the avoidance of doubt, the Parties agree that the Seller shall not be liable for any direct or indirect damage (consequential damage or loss of profit) which occurred by the use of the equipment for a purpose not permitted with the aforementioned warning of the Seller on the preceding use and possible contamination. 2.2. The Buyer has made every reasonable effort to reveal the conditions of the equipment and the deterioration thereof from its original, new condition, therefore no liability shall be assumed of the Seller regarding the condition of the Equipment. 2.3. The Buyer shall indemnify and hold the Seller harmless for any potential claim or damage arising from the restricted use of the equipment and made against the Seller. 3. Buyer agrees and covenants not to sue or take any other legal action against Seller or any of Sellers predecessors in title under any federal, state or local law, common law, ordinance, rule or regulation now existing or hereafter enacted or promulgated, for any matter relating to the Equipment, any uses of the Equipment or the materials or products that came or will come in contact with the Equipment, including cephalosporin, and Buyer shall hold harmless Seller against all liability and claims that Buyer may suffer, sustain or become subject to as a result of (a) the presence of contamination of any kind, including cephalosporin contamination, on, in or around the Equipment existing on, prior to or after the date hereof, regardless of when or how discovered or identified, (b) any other liability or claim, whether made on, prior to or after the date hereof, arising out of the use or ownership of the Equipment (regardless of whether or not referred to herein or otherwise disclosed or known to Buyer or Seller as of the date hereof) or (c) any failure to comply with any "bulk sales" laws applicable to the transactions contemplated hereby. 4. This Equipment Agreement and Bill of Sale and the transactions contemplated hereby shall be governed by, and construed in accordance with, the laws of Hungary, without giving effect to principles governing conflicts of law. 5. The provisions hereof shall survive the delivery of the title to the Equipment from Seller to Buyer and shall be incorporated into the title to be delivered to Buyer as a covenant running with the Equipment, which shall be binding upon all subsequent successors, assigns, transferees and owners of the Equipment. 6. Due to the risks, representations and warranties described above, certain pieces of Equipment (?Restricted Equipment?) are sold to the sole use of the Buyer or its affiliates, therefore the Buyer represents and warrants that the Restricted Equipment will be used only by the Buyer of the affiliates thereof. At any given time, the Seller shall be entitled to request a proof of usage and/or connection between the Buyer and its affiliate, following 5 (five) years of the transfer of title of such Equipment. In case of each piece of Restricted Equipment, such quality thereof is clearly indicated in its description. Any acquisition for stock for a later sell to any third-party or any attempt thereof is strictly forbidden under this Equipment Agreement. In case of any such act, the present Equipment Agreement shall be considered as breached, in which case the Buyer shall be obligated to pay a penalty in the amount of 100 percent of the purchase price of the Equipment. 7. In any case the Buyer buys any piece of Restricted Equipment on behalf of a third-party bidder, whom has already assigned the Buyer to realize such acquisition (?End User? ), the transaction to the Buyer may only be made, if the End User declares by singing the template declaration that it is aware of the provisions, representations and warranties of this Equipment Agreement and accepts thereof as binding to itself. The template declaration is attached as a schedule to this Equipment Agreement. 8. The Buyer represents and warrants that it is aware of the fact that the transfer of title of the Restricted Equipment is subject to the pre-approval process of the Seller, and therefore the Seller by its sole discretion shall be entitled to cancel the transaction subject to the present Equipment Agreement, without any legal consequences towards the Buyer or the End User, whatsoever.